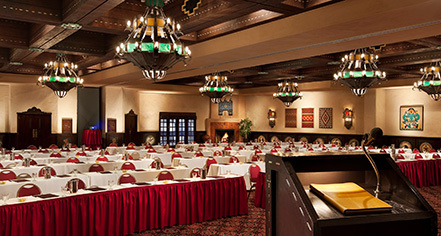 Eight distinct meeting facilities at La Fonda can accommodate up to 600 guests. The Lumpkins Ballroom is a flexible space that can be easily divided or used in its entirety for larger groups. La Terraza is a third-floor terrace that offers stunning views of the Sangre de Cristo Mountains. Smaller groups will find the Exchange Room, Board Room, and Stiha Room are perfect settings for breakout sessions or intimate gatherings at La Fonda. 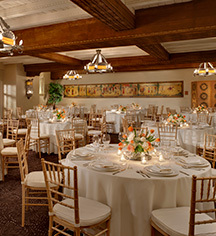 The New Mexico room is a popular choice for banquets and the Santa Fe Room can be used for cocktail receptions or business meetings.